Another from the album of the excellent jedrzej niezgoda Fitzgerald Park was purchased by Cork Corporation in 1901 for the purpose of holding an International Exhibition which was a great success throughout the following two years. Today the park is a tranquil retreat, lying alongside the beautiful River Lee. You can visit the adjacent museum, take tea in the cafe, just sit by the river and perhaps hear the sound of leather on willow from the nearby Mardyke cricket ground. 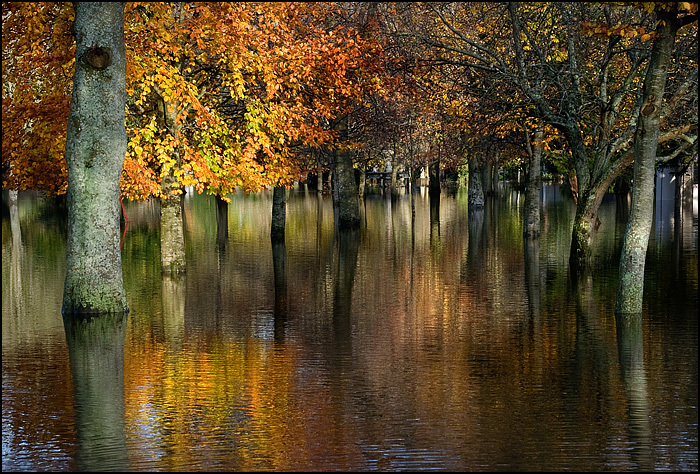 This pic was taken during the floods of November 2009 and the late autumn colour reflections are superbly captured. However, two years later, buildings in the area – including the UCC Mardyke Arena, are still flood-damaged.